Regular Liability pursuant to clause 9.2 below, then in the event that we lose or damage your goods through our negligence or our breach of contract, we will pay you up to a maximum of £50.00 sterling for each item which is lost or damaged, to cover the cost of repairing or replacing that item. In this respect an item is defined as any one article, suite, pair, set, complete case, package, carton or other container. item we will not be liable for any depreciation in value. or unstable goods. This includes goods left within furniture or appliances. not both packed and unpacked by us. Removals is hard work and as part of our commitment to our staff and their wellbeing, they are entitled to take one 15 minute break when they work up to 5 hours, one 15 minute and one 30 minute break when they work up to 7 hours and two 15 minute and one 30 minute break when they work up to 10 hours. For hourly rate jobs we will charge their break time to the Customer. 15.1 If there is a dispute arising from this agreement which cannot be resolved either you or we may refer it to the Conciliation Service provided by The National Guild of Removers and Storers (“the Guild”). A referral of any matter to the Guild by us does not affect your right to pursue the matter through the Court. 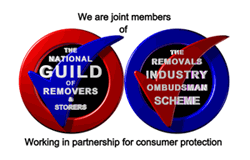 15.2 As a member of the National Guild of Removers and Storers we participate in the Removals Industry Ombudsman Scheme (“the Scheme”). 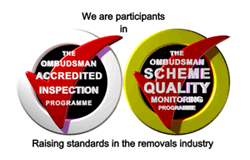 In the event that you are not satisfied with the result of the Conciliation Service referred to above you are entitled to refer the matter to the Ombudsman subject always to the rules of the Scheme from time to time. 16.1 We reserve the right to sub-contract some or all of the work for which we have provided a quotation without reference to you. 16.2 If we sub-contract these conditions will still apply in full. 17.1 If you require storage facilities you are obliged to provide a forwarding address and notify us in writing if it changes. All correspondence and notices will be deemed to have been received by you seven days after posting it to the last forwarding address recorded by us. 17.2 The manner in which goods are transported and whether we use conventional or containerised storage shall be within our sole discretion unless otherwise confirmed in writing. 17.3 Where we provide an inventory of goods stored on your behalf it will be accepted as accurate unless you provide us with written notice of any errors or omissions within 14 days of our posting the inventory to you. 17.4 All charges for storage services are payable in advance. All our charges including removal charges must be paid in full in cleared funds before any goods are released from storage and we shall be entitled to exercise a lien over those goods until we receive payment of all charges due from you to us. 17.5 We review our storage charges periodically. You will be given 28 days’ notice in writing of any increases following which our revised rates as notified will apply. We will always act reasonably in reviewing our storage charges. 17.6 On giving you 28 days’ notice we are entitled to require you to remove your goods from our custody and pay all money due to us. Any such notice will tell you that we will dispose of your goods three months thereafter if you fail to pay all outstanding sums due to us and, in that event, we will do so without further notice. The cost of the sale or disposal will be charged to you. The net proceeds will be credited to your account and any eventual surplus will be paid to you without interest. 17.7 If your payments are up to date we will not end this contract except by giving you three calendar months’ notice in writing. If you wish to terminate your storage contract you should give at least 14 days’ notice. Whilst we will use reasonable endeavours to arrange the release of your goods on the dates you require, specific dates cannot be guaranteed. 17.8 If you choose someone else to collect your goods from our storage facilities we are entitled to make a charge for handing them over.